I bought it for my soninlaw. He saw that my daughter had one, and he wanted one; so I promised that I would order one for him. Thought they would be cute for the older great grandkids. I have ordered these personalized soup mugs several times throughout the years. They are super! Great gifts! Fun presentation when inviting guests over for soup & cornbread! These personalized soup cups make excellent Christmas gifts. Better with handle. One is mine and one for a friend. It's something everyone can use. Affordable and personalized. Everyone on my list got one for Christmas! because it is personalized, the name is hard to find. Family Christmas for traditional Seafood Gumbo. Size of mug! Clean smooth look! And the personalization makes it perfect! I first purchased these in 2013 for our family, and as our family grows and my niece is marring, she needs them too. In the past, I ordered this soup mug for my oldest grandchild now 26yrs old. I am ordering 2 mugs for my younger two grandchildren & their mother. Excellent gifts for family and friends without outrages prices.My cups last for years with the proper care.I JUST LOVE WALTER DRAKE PRODUCTS! I found it very brautiful . I have purchased these mugs in the past as gifts and they were a hit. Love these am giving them as Christmas gifts! Been looking for a large soup mug to use at work! Purchased 2 Soup Mugs for myself and husband. Ordered these for friends for Christmas. I think they are great with the names on it so my grandkids don't fight over them. It is cute and my parents eat soup regularly. I have purchased 4 of these for gifts now. This is a personalized cereal mug which I wanted for myself. I thought this was a unique item. It's large enough not just for soup but also for soda or hot tea. My niece used one of these at my house and wants one for herself , so I am giving her one for her birthday. I bought this for my dad, and he uses it to warm up his soup in the microwave. He really loves this mug. I hope this helps in your decision. how do I personalize item? BEST ANSWER: Thank you for your question. When you find the item on our website, there will be a choice in the drop down box to Personalize the item. We hope this information will be of help to you. BEST ANSWER: Thank you for your question. The Soup mugs weigh 1.5 lbs. We hope this information will be of help to you. No, this soup mug does not come either a lid. No, this soup mug does not come with a lid. BEST ANSWER: Kathy, you can Print name, up to 12 letters/spaces. unfortunately your statement is 14 spaces. If you can re-phrase your message it will be fine. 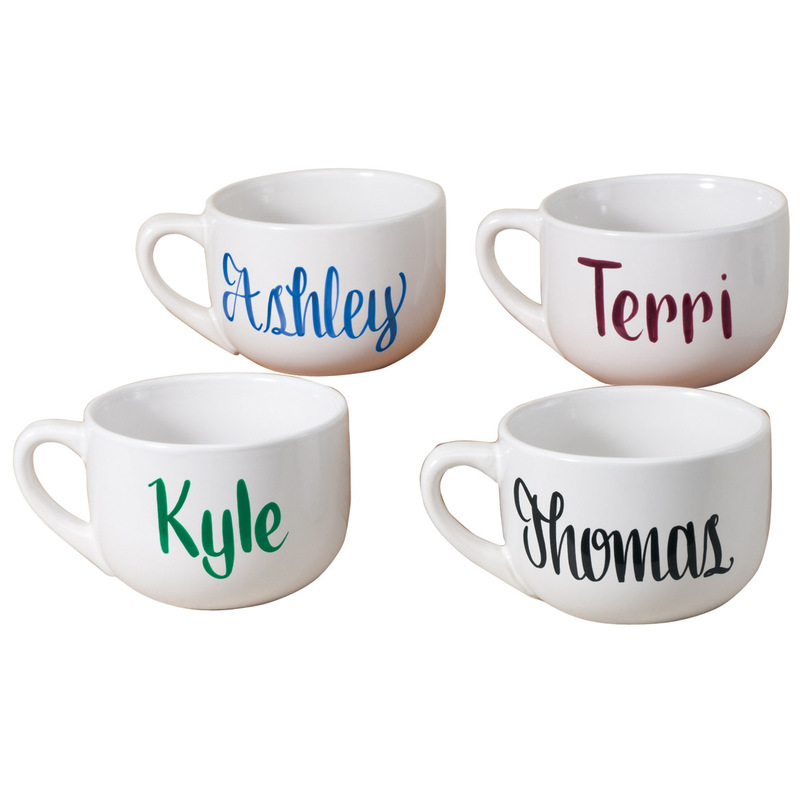 I loved my personalized mugs and the colors and style were nice to truly individualize. You still get the 2+ discount with different names. That's up to Walter Drake. I had them personalized when I ordered them through the company. It says 12 letter limit. can i have a phrase printed? BEST ANSWER: Thank you for your question. You can personalize the mug with up to 12 letters and spaces. We hope this information will be of help to you. If you stay within the amount of words allowed. BEST ANSWER: They are made of ceramic, similar to tea cups and plates. Very nice items. I ordered for my employees for Christmas. They loved it and the fact that it was personalized made it extra special. These are a heavy-grade ceramic which does really well in a microwave. I've used mine for soup, coffee and leftovers. They are made of ceramic like material. BEST ANSWER: large glass bowls, with painted personalization. do not put in dishwasher though because the initials or name will wash off. they are great popcorn bowls for my 4 and 8 year old grandsons they love their name on them! Thank you for your question. The soup mugs are made of Non-porous glazed stoneware. We hope this information will be of help to you. BEST ANSWER: I gave this to my Dad to warm his soups and stews in and he loves it. I'm not sure how long you plan on microwaving it for but it I do know it's good for warming things up really hot because my Dad likes things steaming, and he uses it often. I Hope this helps in you decision. BEST ANSWER: Thank you for your question. The mug is microwavable but the mug will get hot. We hope this information will be of help to you. 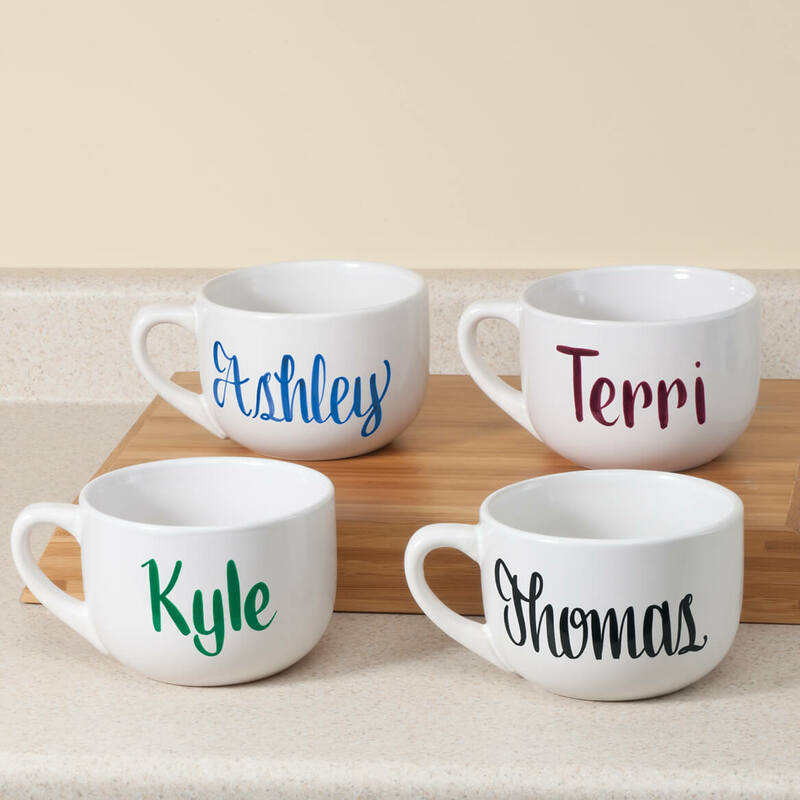 Hi, Can the soup mugs personalize with 4 color printing? BEST ANSWER: Thank you for your question. No, one color per cup. We hope this information will be of help to you. would you be able to put cup of courage? BEST ANSWER: Thank you for your question. These can be personalized with a maximum characters of 12. This is with spacing so it would not fit. We hope this information will be of help to you. I would need 20 of them and would need them by May 15th is that possible? how long does an order take to come in? BEST ANSWER: Thank you for your question. You should expect personalized items to arrive in 6-10 business days. We hope this information will be of help to you. BEST ANSWER: Thank you for your question. Yes, you may order multiples on one order. We hope this information will be of help to you.